Half day, one, two, or three day workshops available. DFW Web-Based is a comprehensive, full-service, financial wellness program that provides knowledge and resources essential to building and executing an individualized financial plan. The program is built around BCH’s five components financial wellness. The uniqueness of DFW starts with a balanced approach to meet every household where it is financially. The goal is to help employees to enjoy life during their earning years while simultaneously planning and investing to fund their retirement years. We refer to this approach as balanced abundance. DFW’s onsite course gives participants the opportunity for immediate feedback and enables them to learn from questions asked by others. Participants for the one, two and three day courses are given assignments before class. During class they work through the plan in their Destination: Financial Wellness workbook (292 pages). This hands on approach is very effective and produces lasting results. DFW Web-Based is a comprehensive, full-service, financial wellness program that provides knowledge and resources essential to building and executing an individualized financial plan online. The program is built around BCH’s five components financial wellness. The uniqueness of DFW starts with a balanced approach to meet every household where it is financially. The goal is to help employees to enjoy life during their earning years while simultaneously planning and investing to fund their retirement years. We refer to this approach as balanced abundance. DFW’s online program is self-paced or completed at the duration established by the client. Each module is presented in 2-7 minute segments for ease and convenience. It is available for use on various devices such as smartphones, desktop computers, laptops, and tablets. In other words, DFW is ready anywhere at any time. Half day or one day workshop. This session is focused on dealing with excessive debt by establishing a debt reduction plan and restoring credit to a level acceptable to pass the portion of security clearances pertaining to excessive debt and credit scores. A comprehensive credit analysis and review are included. One or two day workshops available. show how scores are determined, rated and weighed. A comprehensive credit analysis and review are included. Onsite half day, one day or four hour teleconference/webinar available. 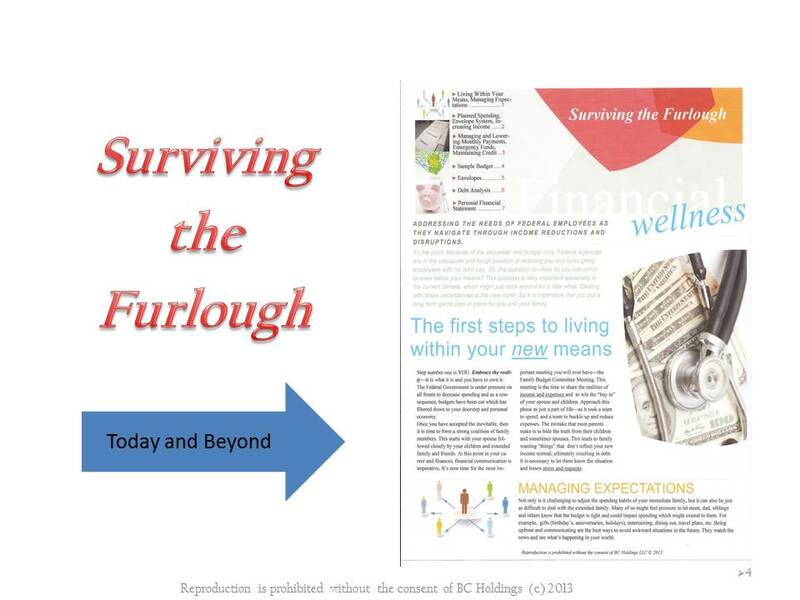 This topic was requested in light of government shutdowns and furloughs in the recent past. Additionally, it has been great for companies and employees faced with the harsh reality of downsizing. Because we care deeply for the wellbeing of their employees, this session is serious and real, yet encouraging and reassuring. We inspire employees to embrace the present while looking and planning for the future. The session ends with safeguards necessary to survive future interruptions without pause. It is uplifting and empowering. Via email, participants are given the opportunity to email an unbiased financial coach at BCH for assistance. This service is available with the purchase of other programs and services and is effective as long as the participant is an employee. FinTips are monthly newsletters written and distributed by BCH each month (via constant contact – available upon request). Newsletters are sent via email and pertain to information that may impact their personal financial economy and financial fitness. Participants can opt to have the newsletter sent to one or more email addresses and may opt out at any time. Email addresses are not sold or shared with other companies. Blogging provides the platform for an open conversation among the BCH community on topics pertaining to personal financial wellness, readiness and fitness. BCH is available for keynote and presenter roles at conferences, conventions, company meetings, student and parent orientations, etc. As indicated in all of the evaluations, BCH is the “hit” of the event. 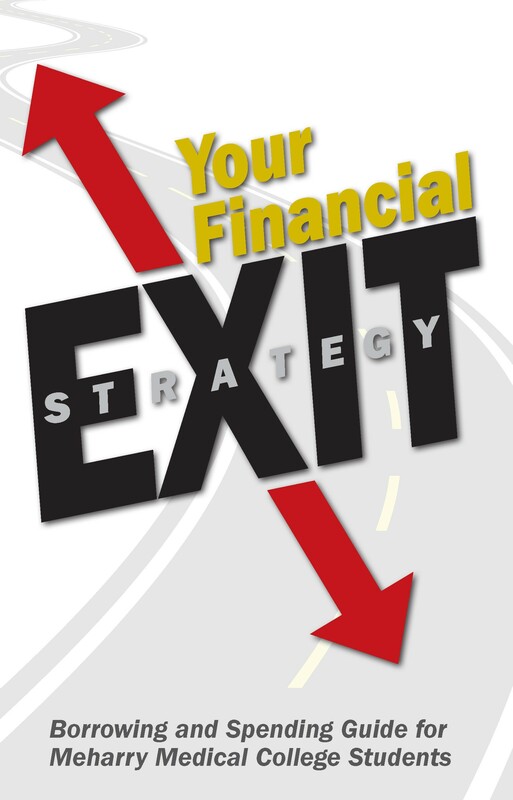 BCH’s post-graduate program, Exit Strategy, not only meets, but exceeds the federal requirement to provide a debt management program for all students graduating with student loan debt. Our program has decreased student loan default rates and borrowing levels around the country. It provides students with sample monthly budgets and debt reduction plans while explaining (in their terms) the importance of paying student loans and other debts on time. Available on a limited basis. Please contact us for details. Financial Education at the high school level expands the most novice of financial minds, opens the doors of what’s possible financially, and creates a windfall of empowerment among our youth. Regardless of a student’s background, education, or exposure to financial education, our program will alter the trajectory of their financial futures and financial quality of life for years to come. The lessons of Destination: Financial Wellness (DFW) will stimulate critical financial thinking which will enhance and propel every student’s ability to manage debt in addition to building and protecting wealth the right way for generations to come. 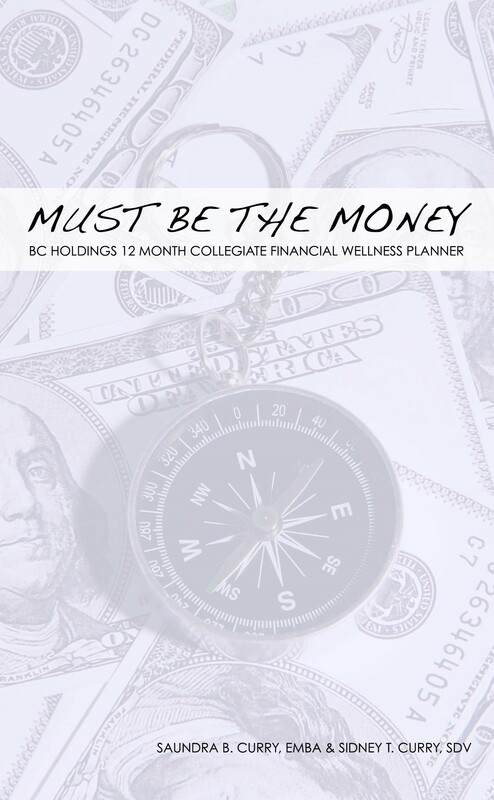 BCH’s approach towards financial literacy to college students is often described as a program that binds financial readiness in college to financial wellness and fitness at the workplace. 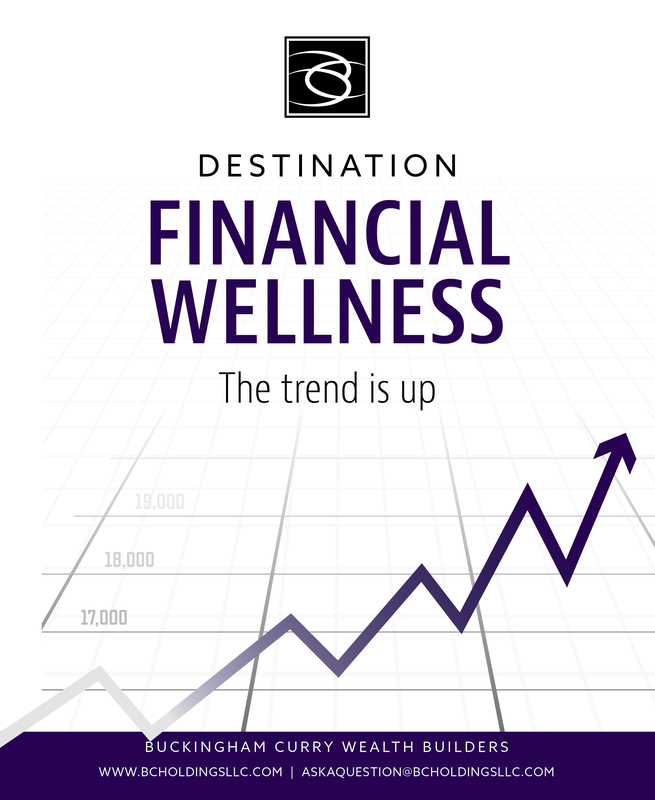 Destination: Financial Wellness (DFW) for college students is holistic, realistic and comprehensively designed to educate during college, beyond graduation and into the workplace. While one of DFW’s primary proof of concept is to strengthen each student’s ability to become knowledge rich for their journey ahead, another critical measurable is the reduction of university student loan default rates. Moreover, while journeying through DFW, students come to appreciate that their financial GPA’s (credit scores) are just as important as their academic GPA because 65% of all companies, including federal and state governments, check credit as a factor to determine employability. Adopting DFW as a part of your university’s ecosystem, creates endless wins for the community, university, parents, students and their careers. The job market is very competitive for students, so any advantage speaks volumes. In other words, don’t give potential employers a reason to question or deny employment to graduating students. Important Note: All training is educational only and is strictly confidential. BCH is not a fiduciary. Any combination of these award winning products or services will yield measurable and quantifiable returns, stronger bottom-line profits, reduction in default rates, increased employee-preparedness, and mission-readiness for your firm, organization and educational institution. Financial literacy has undoubtedly become the new face of higher productivity at the workplace resulting in more secured security clearances and a stronger, mission-ready workforce. Each product and service is specifically developed for all levels of the workforce including management, supervisors, mid and entry levels. They are also excellent for undergraduate, graduate and professional students. To that note, all materials and presentations are delivered to reach each and every participant/student no matter their level of financial awareness or fitness. For more information including pricing, contact us here.